Police said the bombings in east Austin -- two Monday and one on March 2 -- are likely linked. 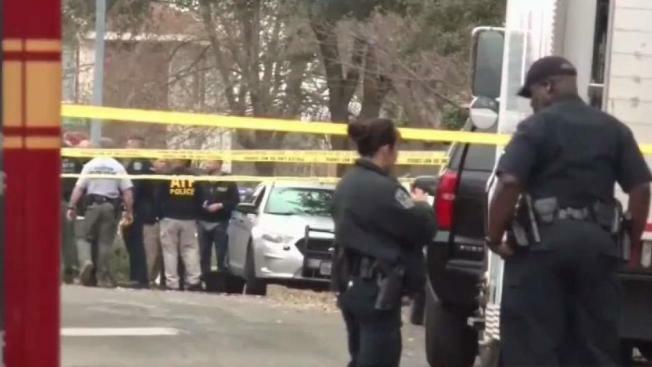 Three package bombs left on doorsteps in suburban Austin neighborhoods have killed two people and wounded two others in under two weeks in Texas' capital city, leaving investigators searching for any possible motive. Three package bombs left on doorsteps in suburban neighborhoods have exploded in less than two weeks, killing two people, wounding two others and leaving investigators vowing to look at any possible explanation for a motive. Police said the bombings in east Austin — two on Monday and one on March 2 — are likely linked. Investigators are looking into whether race was a factor, police said, because all the victims have been minorities. However, they backed off initial suggestions that hate crimes could be a core cause and are not ruling out any possibilities. Austin Police announced on Tuesday a $50,000 reward for information that leads to an arrest. Texas Governor Greg Abbott had previously announced a $15,000 reward, bringing the total amount to $65,000. The detonations prompted warnings from police departments across Texas, including Dallas Police, which published a bulletin urging people to be vigilant of unexpected package deliveries. Austin Police say since the investigaton started, they have responded to 265 calls for suspicious packages at homes but all were deemed safe. The FBI and other federal officials continue to assist in the investigation. 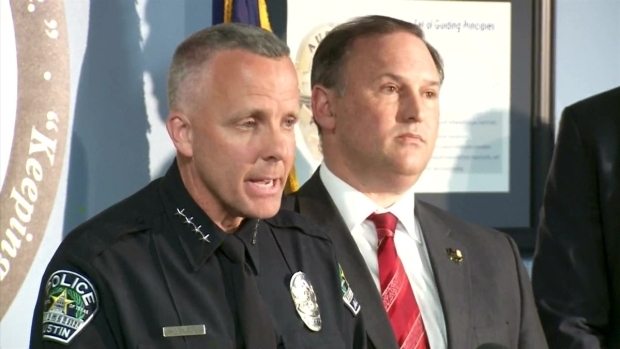 Austin Police Chief Brian Manley said, "We're not saying that we believe terrorism or hate is in play, but we absolutely have to consider that because we don't want to limit what we are investigating, what we are considering and how we are approaching this case." "I don't look at it as terrorism, but it's terrorism of a community for sure," Sherrow said. The first of Monday's blasts occurred early in the morning, when a package that had been carried into the kitchen of a home and exploded upon being opened. The blast killed 17-year-old Draylen Mason and wounded a 40-year-old woman, both of them black. Hours later, authorities were called to the scene of another explosion also triggered by the opening of a package. That blast wounded a 75-year-old Hispanic woman, who was taken to a hospital with potentially life-threatening injuries. Investigators announced on Tuesday that she remains in critical condition. Both of those explosions are thought to be linked to a third blast that killed Anthony Stephan House, a 39-year-old black man, on March 2. Manley said investigators initially thought the March 2 package bomb was related to a recent police bust of a nearby stash house. But after Monday's dual explosions, Manley said authorities now believe all three are connected. "This is the third in what we believe to be related incidents over the past 10 days," Manley said Monday. Authorities have not settled on a motive. Since multiple people live in the homes where the package bombs were delivered, it's unclear who the intended targets were or whether the packages were left at the intended addresses. Two of the three families targeted by the package bombs knew each other and were connected through local activism in the black community, a civic leader said Tuesday, but it was not clear how they might be tied to the third household. Investigators have not publicly released many details about the packaging of the explosives, citing the ongoing investigation, but Manley described them as "not particularly large." In all three cases, he said, the packages did not appear to have gone through the U.S. Postal Service or private carriers, but were left on doorsteps without knocking or ringing doorbells. Monday's attacks unfolded as tens of thousands of visitors arrived in the city for the busiest days of the South By Southwest music festival. The deadly incidents didn't appear to be related to the gathering, but authorities urged tourists to be vigilant and warned local residents to call authorities immediately if they receive unexpected parcel deliveries. In a tweet, organizers of South By Southwest said they were "heartbroken by the explosions" and urged visitors to stay safe. There was nothing obvious linking the three areas where the bombs exploded, other than all were east of Interstate 35, the main highway that divides the city. The east side historically has had a larger minority population than Austin's west side, although that has changed in recent years, as migration and gentrification have changed demographics and raised home prices throughout the city. Monday's first blast happened in Springdale Hills, a leafy neighborhood of houses mostly from the 1960s and 1970s. That was about 12 miles south of the home where the March 2 package bombing occurred. Monday's second explosion, meanwhile, occurred about 5 miles south of the day's first blast. "They're saying, `Somebody put a bomb! Somebody put a bomb!'" Rendon said.